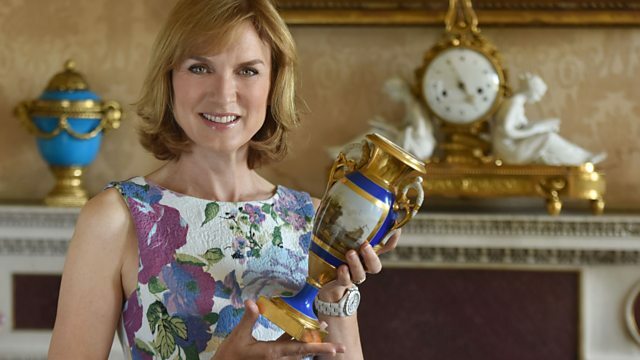 The team travel to the Lake District where Fiona Bruce and the experts meet hundreds of local visitors proudly bringing their family treasures for evaluation. Browse content similar to Holker Hall 1. Check below for episodes and series from the same categories and more! Imagine if you could live in one of the finest country houses in the land. Imagine if you had TWO to choose from. from Holker Hall and Gardens in Cumbria. 'Holker Hall has never been bought or sold. 'it's changed hands through marriage or inheritance. 'Every generation seems to have fallen in love with it. 'And who can blame them? the seventh Duke of Devonshire. also appealed to the Duke. And he decided THIS was the place he wanted to raise his family. for example, which was made by the children. And it features scenes from Russia, like the Kremlin, here, for example. but it was around the time of the Crimean War, the 1850s. It's called a nursery yacht. It's a very rare survivor. There are very few left in the country. rocking backwards and forwards on this. I'm sure our experts would love to see it. when a fire started here in one of the children's bedrooms. Fortunately, everybody got out safely. But it wrought terrible destruction. as the west wing of the house was completely gutted by the flames. and it was going to be more spectacular than ever. His daughter Louisa took charge, and oversaw much of the grand design. And work began within weeks. The reconstruction of this entire wing took three years. completion of the rebuild in 1874. And the wooden panelling holds a message as well. so each letter of her name is inscribed in the paneling. as we welcome visitors to today's Antiques Roadshow. Let's join them in the Deer Park and in the formal gardens. Here at Holker Hall, I understand there's an annual flower festival. Now, I think this could be the prize exhibit. -I inherited it. It belonged to my grandfather. and almost certainly bought it in the Far East. Well, this is a Chinese dish. and carried on for some time. But it really is quite rare on this scale. That way up, there we are. There is a four-character imperial reign mark. The Qianlong Emperor reigned from 1736 to 1795.
or is it a copy from a later date? Um... And it makes a huge difference to its value. It's a question of judging it on the quality of decoration. Is it of imperial quality? Is it from an imperial workshop? The shape of the dish comes into it. Is this an 18th century shape? Is this a 19th century shape? and the style of the mark. rather than a Qianlong one. But what you want to know is the value, don't you? It has a small chip on the rim, just down here. we're looking at £2,500 - £3,500. it looks like a typical French 19th century, mid-19th century table. But we know it's different, don't we? We do. It's actually Russian. -Where did you get it from, Russia? But it never got into the shop. You bought it off the back of a van, or something? -We bought it off the back of a van. -Of course, it's a small lady's writing desk. Um... We know there's a label under here. which is the official residence of the royal family, the czars. -What do you know about it? -They were sold off, in the 1920s. After the revolution, they sold a lot of furniture off. in I think 1929, revolutionary sales. -And that's how it came to, presumably, England. -If only it could talk to us and tell us more. What's it seen? Who's written at it? -In Russia in the 1850s. what's known as Napoleon III, Napoleon Trois. It's known as Boulle as well. This is a generic name. also this type of brass and turtle shell. -Commonly thought to be tortoiseshell. It's not. It's sea turtle. The red, and the brass. and the smaller parts are brass. They hadn't quite finished it. No Frenchman would do that. or something just to join it together. I think somebody's sold the marquetry to the Russian maker. -..which is very unusual, and certainly not a French style. It's not French. They just never did it like that. And this shape is Germanic, possibly Russian. this extraordinary rare label on the back. So what... So when did you get it? A long time ago? It was... I think the late '70s. -And, keep going, because it's from the Winter Palace. Keep your back straight. That's it. What a... A fabulous bit of weightlifting equipment. And, yeah, thanks on that bone-crushing handshake! -Look, you look fit as a fiddle. How long have you been acquainted with this weightlifting...? Almost 60 years I've had this bar, yes. -Yes, I've got a pulse! Well, you're a great inspiration. I understand this dates really from the early 20th century? patent fitness machines coming on. it was high-fashion across many nations. -The bar itself is made of brass. And... The bar itself is steel, actually. Right, so a steel core. -Sort of a shell or a tube of brass over that. collar, with this equally thick gauge hand tightening wheel. of this Bull and Paton bar that has got these. -So I think it's unique. -Because it must have been 40 years old when I got it. Yes. Is this all the weights you've got? -Oh, no, I've got quite a few at home. All right. With the Camberwell stamp on them. I've got... Well, I've got two 50 pounders in the car. Cos, you know, this is such a rare piece. And, I mean, there is a market for these. And I think that you could sell this at auction for around £2,500. But you've got two more weights in the car. So why don't we add another 500 and make it 3,000? I can't help but notice the size of this waistline. I don't think I know anyone who could fit into a dress like this. Oh, I just love them. and they portray an era that we've lost completely. And they're just ever so nice to have. -And how did they all find their way to you? thing, and they gave me them. Of the ones that you have in the collection, are there more than this? I have got quite a few more. but nevertheless, they still portray that era of long-gone elegance. -Where did these come from? Well, these are Ulverston dresses. These were two Ulverston ladies. she died when she was 16. -This is her sister, Hannah Petty. And obviously she lived for quite some time afterwards. I know the pedigree, as it were. It sounds as though you know these dresses sort of through and through. Do the other dresses have names, too? That one there is Minnie Briggs. walking up the aisle of the church in the 1870s. Possibly in this... In this dress. In that dress, yes, in that very dress. You really have got the history that goes with them. This is so often what's lost. Well, here we have Sarah Huddleston. Now, she was a farmer's wife, and she lived at Baycliff just outside Ulverston. she is an unusually tall lady for Victorian days. She must be about five foot ten. And this is a very sort of humble, 1830s dress. They're all day dresses, aren't they? -And all of these materials have been printed. This is really a stunning little dress, isn't it? So it dates from the 1830s, I would say. of the young Queen Victoria when I look at something like this. and then the skirt, pleated and just beginning to be full. But I love the trimmings. Oh, it's the green fringing and how it tones in with the rest of the colours. The dressmaker must have taken great pains in finding exactly the right colour. the top end of the range. that were more likely to be printed cottons. fit into that sort of middle-class bracket. You're so enthusiastic about these. You don't really want to know the value, do you? and then maybe £50 to £100 for the other two. But these really stand out. I could never, ever part with them. They're wonderful. The House at Pooh Corner by A.A. Milne, illustrated by EH Shepard. A first edition, and it is signed. It's got a dust wrapper on it, which is almost unheard of. So you paid top price for it? Well, now it's probably worth £2,000-£2,500. Well, that is surprising, that really was a good buy, then. I think it was an incredible buy! You take it to our jewellery experts. I think they will find that very interesting. was fire. So many houses were destroyed by fire. because there was no organised fire brigade. is of course we are dealing with the development of the Fire Service. -Why did you come to this subject? and somebody sent me a helmet, and that was it. I got the bug. And it's just escalated ever since. So you have become addicted to the history of the Fire Service? Does it start with military style..? Which, that's an 1880s French one. Right. In France wasn't the Fire Service part of the Army, initially? It was, it was, that's exactly what that one is. were you interested in the history? Yeah. I've always had a passion towards the history of it, yeah. ..that's as Chicago Fire helmet from basically the 1900s. hence the high eagle and the big badge. It's basically made out of buffalo hide and very strong. Why did they move away from the metal? firemen were starting to get electrocuted. Papier mache. And various sort of moulded materials. -So, when you were in service, what were you wearing? what they call a Middlesex pattern, which was made out of cork. Nowadays everything is much more standardised. when little local brigades were established, is that right? And they all had their own badges. -They had their own helmet style. -I suppose, appeals to collectors? You got very, very small packets of history. When did it all become standardised? Erm, basically, after the war. There were five or six specific patterns. -So it becomes the national Fire Service? Oh, yes, yes. I talk to one or two from various countries. who, I send him police helmets and he sends me fire helmets. -So the world is your oyster? -You can go on forever, can't you? What are you going to do when you've got 1,000, or 2,000? Oh, don't go there, don't go there! Get into trouble, I would think! Now, standard helmets fetch £100, up to £250. -Which ones here are much more? This particular pattern, they can go up to over £1,000. Yeah, so the average price, as I say, is £200, is that fair? -Well, that takes us to £20,000. I think we should stop there. -And then there are the exceptional ones, on top of that. So that's creeping up to £25,000, isn't it? You're a great collector and it's wonderful to see them, thank you. tooling of gold round the edge and within is an enamelled pendant. So, tell me why you brought it along today to show it to me. I know it's a reliquary. It's got a relic in the back. has always said that she thought it was a Victorian copy. And I've always thought it was a lot older than that. You would like me to tell you that this was 16th century Elizabethan. Because it looks it, doesn't it? -That's what my husband thinks, actually. It's got that renaissancey feel about it, hasn't it? -And look at the colours. polychrome colours, greens, whites, blues, reds. Line of rubies at the bottom here. Is that giving you more cause for hope? Well, yes. I mean, a copy would be paste wouldn't it? it's got some very visible repairs that have been undertaken. You see that backplate, did you notice that backplate? I knew the backplate and I didn't know if it was a repair or what. Yes. It is a repair, unfortunately. All right, shall I tell you what it is? so they made these sort of things. so they've carried out their task with great aplomb, haven't they? here valuing it at at least, what? £10,000, probably £15,000. But, I'm afraid to tell you, it's only worth about £150. -Great. Because now I can wear it. I bought this piece recently from my sister. my brother at the moment but I'm custodian of them. So it's a family connection? They were collected by my grandfather who collected all sorts of things. with two of the best names. WS Mycock who decorated, Walter Crane who was the designer. The back is almost as beautiful as the front. It's a local piece made just down the road. which is Doulton from the 1920s but still at the top of their game. but this owl has caught three mice and this one has only caught one. There's a little bit of humour in them. So you bought this from your sister? I paid her £500 for that. OK. What would you do if I told you it was worth more? I intend to pay her more. -Yeah, I'll make sure she gets it then. That was witnessed everybody, wasn't it? They are not, they're my brother's. -They're worth £600, the pair. -Are they? Very nice too. -It's a pleasure, thank you. to all kinds of other Glam Rock bands. in you, Paul Fenton, a drummer of wide experience. Tell me who you were working with at that time? in every record buying country in the world, so I got to travel with him. we used to meet some amazing people. wanted to find a drummer who wore snakeskin and they went to the right place. was working with McCartney and Bowie and all the rest of it. I met all those incredible people. I went to meet Marc and we toured for a while. it's when Marc Bolan, T. Rex, released Ride A White Swan. which was a kind of Beatlemania for T. Rex. and you couldn't hear a thing for, it was mayhem. they would still be screaming half an hour after he had left. That will always stay in my mind. it was almost like a pantomime. that you used to be able to fit that? I did, yeah. I managed to get into it OK and drum with it and it was amazing. I'd just never seen anything like it. There was no-one else had jackets like this. alongside Bowie, actually, and presumably, you all swapped clothes? what makes you interested in this particular period? I have been so interested in this period. It just sums the whole period up. or certainly worn by Marc, it comes from a shop in Rodeo Drive. you could imagine Marc wearing that, couldn't you? a beautiful friend, love Marc, kissy kissy. he would take us out and be very generous. their fortunes have gone up and down. Now, I think things are slightly settled, let's put it that way. the jacket, perhaps we are talking about £300. picture of Marc actually wearing that suit. -That would boost it into maybe the low four figures. But at the moment I'd have to put it at perhaps £400. This I think is the real treasure. -That was his own copy he gave me. It's terrific. I would put this at around £500. I have really enjoyed sharing your memories. We've enjoyed it immensely also. intricate lovely little ones like these. Tell me the history of them? the lady gave these toys to my grandfather. killed on the same morning in a First World War battle. Oh, my goodness. How old were they? I couldn't tell you, obviously 18 at that time. Yes, yes. But what a terrible story. and in those days children played very gently with their toys. -Because they needed to be very gentle, didn't they? because they really didn't cost very much in the late 19th century. Nuremberg, so you're right, they are German. And they're made of tin. Known as tin plate toys. Ges Gesch, the registered trademark. Just to show that they were registered in Germany. and then they went on right through to 1920. So these could be somewhere around 1900. They are quite flimsy, really, very light. A lot of work in them. considering they are so terribly fragile. I would put an estimate, at auction, of £500-£800. Yes. Very good. Excellent. Yes. Yes. -Yes, it's a bit more than I thought they would be. -Yes, yes. Very good, excellent. Now, what is the significance? We've opened this a particular date. October 28 1904. This is the date that our local theatre burnt down. did his first acting at. Laurel and Hardy, the comedians? Yes, he was born in Ulverston, in Argyle Street. -And the theatre that we're looking at now burnt down. the total cost of having all the fireman there was two pounds seven shillings. And this is the report from the fire chief. so large as first thought. I mean, it's all here, isn't it? Lovely local history. 50 years of fire. How can we value that? And who would ever know that Stan Laurel was behind these pages? -We have to put a price on it. I'm going to say £1,000. I'm just amazed by that. Well, be careful as you go home. a lovely apparition sent, to be a moment's ornament. made by Lutiger. But tell me, what do you know about it? It was left to me through my great-grandfather. His sister was married to the artist. He was born in Lucerne, Switzerland, in 1871. And he moved to London and was naturalised in 1912. And married the same year to my great-grandfather's sister. because he studied at the Academie de Marne in Paris. a sculptor trained in the tradition of sculpting animals. Most of his work was with animals. -This is the only non-animal one that I know about. He exhibited at many different places. He was a Royal Academician up until 1931.
she has an apple in her hand. There is no doubt in my mind he's a skilled, skilled sculptor. even down to the detail of the little lock of hair. That is beautiful, that is just that little extra touch. Lutiger, and it's dated 1923-24 on the base. Clearly inscribed in the bronze. there wouldn't be another one, I don't think. And I wouldn't be surprised if it didn't make a little bit more. I love her, it's even got me reciting poetry. For this week's enigma, we have Mark Hill to thank. and only one of them fits the object, our enigma. Well, it's fit for purpose, but what purpose? or an object or a utensil like this for every single purpose. So the first option is a sugar cane slicer. -I'm not allowed to pick it up, am I? and then sliced. You wouldn't want to put your finger in there, would you? -So, sugar cane. I'm not sure about that. -OK, we're not liking that one, come on. The second option is a marmalade maker. just like the sugar cane slicing. -OK, who here has made marmalade? No. I mean, I've made jam. OK, so stick a bit of orange in there. -in order to get it in there. very much like the cane, you could just feed it through, as well. It would be quite something to squash an orange like that and push it through. -It could be a cucumber cutter? You've got your own definition, have you? OK.
A fourth option opens up, my goodness! My goodness, I think I'm just going to cross my legs at that! Whatever you say now is not going to be as interesting as that. No way! The alternative is a rope cutter. Sugar cane? We didn't like that. You're all changing your minds now. -Oh, sugar cane's having it. Let's have a show of hands for sugar cane. And is anyone buying the marmalade? -And where are you from, sir? I was going to say, so an Aussie's now telling us it was used for making marmalade! Is going to be sugar cane, because that's what most people are saying. because it is a marmalade maker. Well done! Congratulations, they were right. -And how did you know this was going to be a marmalade cutter, then? Sugar cane's the same. Oblong hole. -There speaks an engineer, I feel? -rather than the normal antique jewellery that I look at. And this is obviously a ring that's very special to you. How did it come into your collection? I think. She liked this a lot, and she wore it a lot. -And how did that come about? and it ended up on the road. -Not on my mum's finger, I'm happy to say. and she somehow or other managed to restore it to its shape. and this was very typical of her style. ..about her attitude towards hallmarking? before 1973, they didn't have to hallmark jewellery. -And perhaps you could just read what it was that she said about it? of the hallmarking process, actually. She says, "As to the matter of a hallmark, I detest the idea. "One never knows what condition the object will be left in." Well, this is it, isn't it? -they didn't do repeat designs. ..but that was the big thing, wasn't it? It really was. one of the first females - living female artists - to do that. So in that respect, she is highly collectable. and much more exuberant in design over the time. £4,000 or £5,000, that sort of level. something like this could do exceptionally well. I just have to remember to wear it more often, don't I? What room do you have this in? I would have been rather worried if you'd had it in the dining room. and they take the top off a monkey's head and start eating its brains? -I went to the cinema to see that. but do you find it fun? I don't know if I find it fun, but I live with it. -That is about as good as it's going to get. It is a little novelty clock. And, of course, the time is read with the eyes. Do you have it running at home? -So you've never actually tried to tell the time with it? No. I don't know how to. -in this instance, the eyeset. OK, so here we go - I'm just going to move him round. So I'll move the minutes around. Can you see them going round there? There it is, on the clock. I mean, it's really weird, isn't it? all sorts of little animals - and the monkey is really quite scarce. ..so it's worth knowing what he's worth, isn't it? It'd be nice to know, definitely. See if I want to continue living with him! Live with him, or do something fun? Oh, I'm happy to live with him now. croquet lawn of this house, doesn't he? -Oh, right. He looks about 18, doesn't he? who became a teacher at Manchester. This was an exhibition catalogue. ..romanticising it in a very French way. -Was he taught by Valette? -He was taught by Valette. -Ah, that's the connection. I see. who painted very similarly, sort of French Impressionist paintings. -Yes, I've seen his stuff. the First World War, maybe as late as 1920, and it's oil on canvas. -But it's never been varnished, and that's why it's got glass on it. to suggest the work coat that he's wearing. -And just a few strokes, he's got it, hasn't he? -It's so confident, it's so...so strong, and so brief. He's not quite so good at the hands, I think. -They don't quite make sense, do they? -I can't read them very well. But the face - I mean, it's so alive and intelligent. energetic young man, wide awake to the world. -You must have known him in later life. -Yeah, I mean, he was a real character. there's a lot of stuff in here. Here's actually an article actually about himself. -Well, I think it's the most wonderful thing, I really do. It's so alive. I've not seen many portraits by Valette. -..which, by the way, is very interesting. which comes directly from Valette, the way he does it. Here he is, such an influential teacher, obviously on your uncle as well. -Erm...what do we think it's worth? -"That's the thing that I'd love to have." -..less so, perhaps, to the general market. that I think it's worth about £6,000. -It's never going to be sold. -That's got all of your attention! I used it, I'd say, nearly every day. We're looking at about £50-60. around £100, probably. Something like that. I can only imagine he would look like this. is by an altogether different name. And just round the corner, we've got it there - Louis Wain. Tell me, how did you come to own him? which has been in the family for 90 years. clearing out - right at the bottom was this. And I must admit, I looked at it and thought, "Mm, not very nice." "that you think might be of value or interest, please let me know." "Ooh, Louis Wain - nice!" So, I said, "Oh, OK."
I said, "Sorry, I don't know who Louis Wain is." And she said, "Well, you know the man who did the cat pictures?" And I then remembered having seen some. creating all these fantastic objects. -..of which this is one. and then they came back into production in around 1919-1922.
and he's one of the ones that is clearly stamped "Made in England". -So his name is The Lucky Pig. -Is he lucky for you? Well, not lovely, but, yes, nice result! We do see a lot of these type of albums on the Roadshow. was just how well it was put together. compiled with watercolours and poems, etc. It was passed down the family. And when my aunt died, it passed on to me. So there was a lot of memorabilia. and I thought, "Oh, this is interesting." OK. And so you brought it along today for us to have a look at? Yes. The paintings, I find fascinating. Let's have a look at it, then. Erm, what we have here is a watercolour dated 1918. And obviously, we have a wounded soldier, a nurse and a child. -..during the war. Very well executed. and it's just a wonderful record of a very difficult period. I suppose it helped them get through things as well. we've got a cartoon here. the humorous cartoons of trench life. And the title of it is, "There goes our blinkin' parapet again." And there was one across the bay at Morecambe. So, obviously, this sort of ties in nicely. and it's dated September 1917. Well, it's an absolutely fascinating album. "By hook or by crook, I'll be the last in this book." -And there he is on the gallows. -It's not quite the end, is it? -Because I haven't valued it. -at auction in the region of £150-£200 for it. -Thanks very much for that. I did a bit of internet research, and I bought her that. Question is - is it in fact a Jacobite glass? Well, tell me what a Jacobite glass is. and are, basically, Georgian glass. where his revolt was completely wiped out. -Escapes, helped by Flora MacDonald. Never to be seen again in the British Isles. -So his goose was well and truly cooked. it does date from that period. it's sufficiently badly made to be period. that old glasses are being embellished. exists today in very much the form that they were 250 years ago. Question is - what did you pay for it? but if it's worth half that, it doesn't matter. Well, it isn't worth half that. -Isn't it very nice indeed?! -Now, do you use it? -That would be fab - take a picture and send it to me. Well, we could not come to the Lake District without Beatrix Potter. and I have selected just these three. So how did these come down to you? who was a solicitor in Lincoln's Inn in London. -And my grandfather also worked there as a solicitor. have read them to our children. are all signed presentation copies. And we start off with Mr Tod, first edition. But unfortunately, it lacks the spine. that I... Cos I requested it. So that's why it's so thumbed. She doesn't sign Beatrix Heelis, because she's not married at that stage. And here is the title page and the frontispiece. "biscuits, all charming for mice. "and Appley Dapply is so fond of pies." I'm sure you've heard it all before. And the spine is on! -Which is tremendous, I love that. And that is a beautiful copy of the first edition. "..Beatrix Potter". November 24th, 1917. Well, she had married by then. But, er, that was quite late. which is not in good condition. The spine, again, is rather tatty. because I think of the inscription here. Here we are - "To Mr Edwards, with kind regards from Beatrix Potter. in the Lake District. The frontispiece is Hill Top Farm. -and all the rest of it. -I would assume so, yes. "and the pictures are all in Sawrey and Hawkshead." And here is the frontispiece - Hill Top Farm here. has to be the cream of the crop. because we have to come to value. I'm going to put £12,000 on that. A collective value of £25,000. to see the work of one of its most famous residents. From all of us here at Holker Hall in Cumbria, bye-bye. There's an eclectic mix of objects featured ranging from a writing desk from the Tsar's Palace bought after the Russian Revolution, over 100 vintage fire helmets owned by a former firefighter, Edwardian weightlifting equipment still in use today by a 75 year old owner, and a collection of glam rock stage costumes. But closing honours goes to a rare collection of signed first editions by Beatrix Potter still owned by descendants of the writer's solicitor.